Acta Universitatis Lodziensis. Folia Sociologica has been published since 1980. From its very beginnings it has been striving to be an ambitious journal commenting on the changes which both Polish and European societies have been subjected to. Its papers include presentations and research reports, social and political analyses, interesting analytical and methodological texts. Issues of Folia Sociologica include journals published in English (this was the format of the first issue of the journal), or issues published in two or three languages; a volume in Polish and Russian and a volume in Polish, English and German. The profile of Folia Sociologica includes the broadly understood subject matter of social issues. The intention of the editorial team is to publish papers being a result of original empirical research, both individual and collective. The editorial team is open to different theoretical and methodological paradigms. The journal will publish papers from the field of social and humanistic sciences, including texts which refer to both the classical and contemporary sociological thought and all its sub-disciplines. It is also supposed to publish papers which deal with the subject matter combining sociology with other disciplines, such as anthropology, ethnography, political sciences, social psychology, psychosociology, demography or management sciences. The editorial team stresses, however, that it strives to root the journal’s profile in the sociological tradition, hence papers of this type will be given priority in the decision-making process concerning their publication. Volumes may be either monographic in character or represent an overview of publications concerning different spheres of social life. Each volume will be edited by a person in charge of its substantive correctness. Acta Universitatis Lodziensis. Folia Sociologica ukazuje się od 1980 roku. Od początków swego istnienia starało się być ambitnym czasopismem komentującym zmiany jakim podlegały polskie i europejskie społeczeństwa. Wśród artykułów znajdują się prezentacje i raporty z badań, analizy społeczno-polityczne, interesujące teksty analityczne i metodologiczne. Wśród numerów Folia Sociologica znajdują się również zeszyty wydane w języku angielskim (taką formę miał pierwszy numer czasopisma), ponadto numery w dwóch i trzech językach; zeszyt w języku polskim i rosyjskim oraz tom w języku polskim, angielskim i niemieckim. Profil czasopisma Folia Sociologica obejmuje szeroko rozumianą problematykę społeczną. Intencją redakcji jest publikowanie artykułów będących wynikiem oryginalnych badań empirycznych indywidualnych i zespołowych. Jesteśmy otwarci na różne paradygmaty teoretyczne i metodologiczne. W czasopiśmie chcemy zamieszczać artykuły mieszczące się w polu nauk społecznych i humanistycznych. Czekamy na teksty odwołujące się do klasycznej i współczesnej refleksji socjologicznej, odnoszące się do wszystkich jej subdyscyplin. Zależy nam również na opracowaniach podejmujących problematykę łączącą socjologię z innymi dyscyplinami takimi jak: antropologia, etnografia, nauka o polityce, psychologia społeczna, psychosocjologia, demografia, nauka o zarządzaniu. Redakcja zaznacza jednak, że dąży do zakorzenienia profilu czasopisma w tradycji socjologicznej, stąd artykuły o takim charakterze będą miały pierwszeństwo przy decyzji o ich publikacji. Przygotowywane tomy mogą mieć charakter monograficzny bądź też być przeglądem publikacji dotyczących różnych sfer życia społecznego. Każdy tom redagowany jest przez osobę czuwającą nad jego poprawnością merytoryczną. dr habil. nauk humanistycznych w zakresie socjologii, socjologia przemian społecznych. 2002 – 2011 – profesor WSH-E w Pabianicach. Stypendystka: rządu francuskiego (01.01-30.06.1985); francuskiego Ministerstwa Badań i Technologii (01.09.1992-01.03.1993) – pod kier. Alain Touraine’a. Zainteresowania naukowe: teoretyczno-metodologiczne i empiryczne problemy przemian kulturowego modelu współczesnego społeczeństwa; rola ruchów społecznych w tym procesie. Dorobek naukowy, kształcenie kadr: Autorka sześćdziesięciu kilku artykułów i jednej książki, współautorka kilku książek. Redaktorka kilku książek oraz 7 monograficznych tomów punktowanych czasopism (Przegląd Socjologiczny, Folia Sociologica). Publikuje w języku polskim, francuskim, angielskim, niemieckim i rosyjskim, w czasopismach (m.in. „Roczniki Socjologii Wsi”, Cultures et Societes de l’Est, „Women’s Studies International Forum”, „Kultura i Społeczeństwo”, „Przegląd Socjologiczny”, „Studia Socjologiczne”, „Folia Sociologica”) i w recenzowanych monografiach opublikowanych w kraju i zagranicą (Niemcy, Francja, Rosja, Węgry). * 2013-2016 kierownik projektu finansowanego przez NCN pt. Kulturowe koncepcje płci i wieku a postawy kobiet i mężczyzn wobec swego zdrowia i wyglądu. Promotorka 4 obronionych prac doktorskich (dalsze 3 rozprawy w toku, w tym 2 otwarte przewody doktorskie). Autorka licznych recenzji doktorskich, habilitacyjnych, wydawniczych recenzji monografii autorskich i zbiorowych oraz artykułów złożonych do renomowanych czasopism socjologicznych; Ekspert NCN. Członkostwo w PTS od 1971 roku. Od 2009 roku redaktorka naczelna kwartalnika Folia Sociologica, UŁ. 2002 – 2011 – Professor of the University of Humanities and Economics (WSH-E) in Pabianice. Grant holder of: the French government (01.01-30.06.1985); the French Ministry of Research and Technology (01.09.1992-01.03.1993) under the auspices of Alain Touraine. Scientific interests: theoretical and methodological as well as empirical issues concerning transformations of the cultural modern society model; the role of social movements in this process. Academic output, staff training: Author of over sixty papers and one book, co-author of several books. Editor of several books and 7 monographic volumes of journals with ISI impact factors (Przegląd Socjologiczny, Folia Sociologica). She publishes papers in Polish, French, English, German and Russian, in journals (e.g. Roczniki Socjologii Wsi, Cultures et Societes de l’Est, Women’s Studies International Forum, Kultura i Społeczeństwo, Przegląd Socjologiczny, Studia Socjologiczne, Folia Sociologica) and in reviewed monographs published both at home and abroad (Germany, France, Russia, Hungary). Promotor of 4 doctoral dissertations (3 more dissertations in progress, including 2 admissions into the PhD programme). Author of numerous doctoral, habilitation and publishing reviews of single-author and collective monographs as well as papers submitted to prestigious sociological journals; Expert of the National Science Centre. Membership in the Polish Sociological Association since 1971. Editor-in-chief of the quarterly Folia Sociologica, the University of Lodz, since 2009. Journals of University of Lodz are publishing scientific articles only after double-blind review, language and technical edition. We do not share our articles in pre-publication. The preferred length of papers is between 32 thousand and 40 thousand characters (10-15 pages) together with graphics or/and tables. The first title page below the author’s name ought to include academic affiliations. •Please use Times New Roman font, size 12, 1.5 spacing. •Margins : left and right 2.5 cm; top and bottom 2 cm. Author’s annotations may be formed as footnotes. Illustrations, graphics, figures, etc. : Please name and number them continuously (above the illustration, graphics), and below please note source references. Abstract it should be placed before keywords and the main text and consist of between 15 and 20 lines. Please submit manuscript files in Word (as doc. ), RTF or ODT as only these formats can be used during the production process. The procedure for reviewing articles in the journal complies with the recommendations of the Ministry of Science and Higher Education published in Good Practices in Reviewing Procedures in Science, Warsaw 2011. The Editorial Board of the journal together with the Programme Council and the Editor of the given volume make a preliminary assessment of submitted manuscripts considering their conformity with the journal’s profile as well as basic requirements of scientific rigour and certain substantive level. Papers which do not meet the basic publishing conditions will not be accepted. Furthermore, only those manuscripts which are original and have not been published elsewhere will be considered for publication in the journal. Manuscripts qualified for publication are subjected to peer review by external experts in the field. 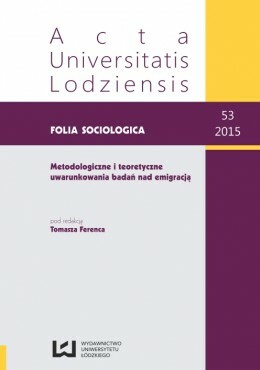 Reviews are conducted on official forms which are available on the website of the journal www.sociologica.online.uni.lodz.pl in the tab Guidelines for Authors. External reviewers shall be independent academics specialising in the subject and cannot be part of the editorial staff or the Programme Council, or be employed in the academic unit to which the journal’s Editor-in-chief is affiliated. Moreover, the manuscripts are not sent to reviewers from the same academic centre as the author, as well as to persons who may appear to be in a conflict of interest with authors, i.e. direct personal, professional and subordination relationships with the author of the article, direct scientific cooperation over the last 2 years (especially concerning the submitted paper). The Reviewer cannot be author of a text in the volumefor which a review of his/her authorship is already being prepared. Papers are reviewed confidentially and anonymously (double-blind review process). The list of all reviewers is published once a year on the journal’s website. The names of the reviewers for each volume are not revealed. Each review must have a written form and it is always concluded with an unequivocal opinion on whether the article should be accepted for publication or not. All papers submitted for publication are reviewed by two experts. Upon receipt of the review by the Editorial Committee the author is informed of its outcome and the necessary modifications. The final decision regarding the publication is made by the Editors in consultation with the Programme Council. Is the paper technically correct (appropriate references, citation formats, footnotes, figures, tables and general standards of academic writing)? May the paper be considered innovative and original with regard to the information it contains? Do the theses presented in the paper derive from theoretical considerations and conducted empirical analyses? Does the paper require shortening or extension of some of its sections, which would positively affect its reading and informative value? Reviewer’s recommendation: Is the paper suitable for publication in the journal’s volume? I. Yes, accept it as it is. II. Yes, with minor revisions. III. Yes, with major revisions. a. does not correspond to the journal’s profile. b. does not correspond to the theme of the volume prepared. c. does not meet formal requirements and standards of academic writing. d. contains methodological errors. e. other reasons (justification below). If answer 3 is chosen, should the modified article be resubmitted to the reviewer? Please add a brief comment on the article including suggested alterations to the text and issues requiring a deeper study and extension:……………………………..
Czasopisma Uniwersytetu Łódzkiego wydają tylko zrecenznowane artykuły naukowe o najwyższym poziome językowym i edytorskim. Nie wydajemy artykułów w ramach prepublikacji. Preferowana objętość artykułu to między 32 tysiące a 40 tysięcy znaków (10-15 stron) wraz z rysunkami czy/i tabelami. Na pierwszych stronach artykułów pod imieniem i nazwiskiem autora należy zamieścić informację o miejscach pracy. Prosimy o pisanie artykułu czcionką Times New Roman , wielkość czcionki: 12, interlinia w tekście 1,5. Marginesy : prawy i lewy 2,5 cm. Dolny i górny 2 cm. Warzywoda-Kruszyńska W. (red.) (2004), Rodzina w zmieniającym się społeczeństwie polskim , Wydawnictwo Uniwersytetu Łódzkiego, Łódź. Elias N.(2009), Społeczeństwo jednostek , Wydawnictwo PWN, Warszawa, s.110-166. Streszczenie artykułu powinno mieć objętość 15-20 wierszy ; prosimy o sporządzenie streszczenia w dwóch wersjach: polskiej i angielskiej. Streszczenie w języku polskim to Abstrakt umieszczany na początku tekstu, zaś to w języku angielskim to Summary umieszczane na końcu, za bibliografią. W przypadku streszczenia angielskiego prosimy również o umieszczenie nad streszczeniem tytułu w języku angielskim. Artykuły prosimy przesłać na adres mailowy foliasociologica@gmial.com w formacie umożliwiającym edycję, np. doc, rtf, odt. Jeśli artykuł został przygotowany w języku angielskim proszę dołączyć streszczenie i słowa kluczowe w języku polskim. Redakcja przypomina, że praktyki określane jako „ghostwritng” i „guest authorship” są przejawem nierzetelności naukowej i dlatego redakcja dokłada wszelkich starań aby tego typu praktyki w procesie publikacyjnym zostały wyeliminowane. Z „ghost writnig” mamy do czynienia wówczas, gdy ktoś wniósł istotny wkład w powstanie publikacji, bez ujawnienia swojego udziału jako jeden z autorów lub bez wymieniania jego roli w podziękowaniach zamieszczonych w publikacji. Redakcja prosi więc o zawieranie w tekstach informacji na temat współautorów badań, których wyniki referowane są w artykule, jak również określenie własnego wkładu w uzyskane rezultaty badawcze. Przypominamy również, że publikowane mogą być teksty przygotowane przez więcej niż jedną Autorkę/Autora. Z „guest authorship” mamy do czynienia wówczas, gdy udział autora jest znikomy lub w ogóle nie miał miejsca,a pomimo to jest autorem, bądź współautorem publikacji. Redakcja czasopisma Folia Sociologica wraz z Radą Naukową i Redaktorem przygotowywanego tomu dokonuje wstępnej oceny nadesłanych materiałów z punktu widzenia zgodności z profilem pisma oraz podstawowymi wymogami dotyczącymi warsztatu naukowego i poziomu merytorycznego. Prace, które nie spełniają podstawowych warunków publikacji, są odrzucane. Ponadto, redakcja zaznacza, że publikowane będą jedynie oryginalne opracowania, które nie zostały opublikowane wcześniej w innych czasopismach. Teksty zakwalifikowane do publikacji przekazywane są następnie recenzentom zewnętrznym, którzy recenzują je w oparciu o formularz recenzji zaprezentowany na stronie www.sociologica.online.uni.lodz.pl w zakładce Author’s Guideline. Za recenzentów zewnętrznych uznaje się osoby, które nie zasiadają w redakcji czasopisma ani w jego Radzie Naukowej, nie są również zatrudnione w podmiocie, gdzie afiliowany jest Redaktor Naczelny czasopisma. Recenzentem zewnętrznym nie może być również osoba, która pochodzi z tej samej jednostki, z której pochodzi Autor. Teksty nie są też wysyłane osobom, które pozostają z Autorem w konflikcie interesów, za które uznaje się: bezpośrednie relacje osobiste, relacje podległości zawodowej, bezpośrednią współpracę naukową w ciągu ostatnich dwóch lat (zwłaszcza zaś dotyczącą przygotowywanego tekstu). Recenzent nie może być autorem tekstu w numerze, na potrzeby którego przygotowuje recenzję. Prace recenzowane są poufnie i anonimowo (double-blind review process). Lista wszystkich Recenzentów publikowana jest raz w roku na stronie internetowej czasopisma. Nazwiska recenzentów poszczególnych publikacji nie są ujawniane. Recenzja ma formę pisemną w oparciu o formularz recenzji i kończy się wnioskiem o dopuszczenie artykułu do publikacji lub o jego odrzucenie. Wszystkie artykuły złożone do publikacji recenzowane są przez dwóch recenzentów. Po otrzymaniu przez Redakcję czasopisma recenzji Autor zgłoszonej pracy jest informowany o jej wyniku i koniecznych poprawkach. Ostateczną kwalifikację do druku podejmuje Redakcja czasopisma w porozumieniu z Radą Naukową. 1.Czy artykuł odpowiada profilowi czasopisma? 2.Czy artykuł odpowiada zakresowi tematycznemu przygotowywanego tomu? 3.Czy treść artykułu jest zgodna z tytułem? 4.Czy struktura artykułu jest spójna i logiczna? 5.Czy artykuł jest poprawny od strony formalnej (cytaty, przypisy, tabele, wykresy, ogólne standardy tzw. academic writing)? 6.Czy artykuł można uznać za oryginalny pod kątem zawartych w nim informacji, tez i konkluzji? 7. Czy zawarte w artykule tezy i konkluzje wynikają z prowadzonych rozważań teoretycznych i analiz empirycznych? 8.Czy artykuł wymaga skrócenia lub poszerzenia niektórych jego części, co pozytywnie wpłynie na jego na lekturę? 9.Czy odniesienia do literatury przedmiotu są adekwatne i uzasadnione? 10.Czy artykuł może być uznany za opracowanie naukowe (zawiera tezy, ich krytyczne rozwinięcie i podsumowanie), czy jest to głównie opracowanie o charakterze raportu z badań (głównie prezentacja danych)? 11.Konkluzja: Czy artykuł nadaje się do publikacji w tomie? III.Tak, po wprowadzeniu zasadniczych zmian (ponownym przygotowaniu). a. nie odpowiada profilowi czasopisma. b. nie odpowiada tematyce przygotowanego tomu. c. nie spełnia wymogów formalnych i standardów dotyczących tekstów naukowych. e. inne powody (uzasadnienie poniżej). Czy w przypadku odpowiedzi 3 życzy sobie Pani/Pan do recenzji aby ponownie przesłać artykuł do recenzji? Proszę dodanie krótkiego komentarza na temat artykułu, wraz z sugerowanymi zmianami i uzupełnieniami jakie powinny być wprowadzone:…………………………….